The dream of Tokugawa Ieyasu has come true: together with his son Hidetada he rules all over Japan. The story of Saizo's son, Kirigakure Saisuke, who after seeing his father die at the Battle Of Shimabara, grows up to be an expert ninja. It is the 1570's in Japan. Ninja Kasumi Kanbey specializes in making gunpowder. He lives with his young son Kojiro, who witnesses his assassination by five skilled ninjas. Kanbey manages to kill two of his attackers before succumbing to their attack. Kojiro embarks on a journey to avenge his father against the remaining three assassins. His first attempts meet with failure and so he begins seeking training from a Ninjitsu master to become skilled enough to eliminate his enemies. The master is said to be hiding in the Kai Province of Takeda Shingen. 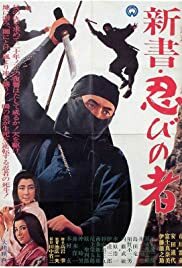 Stars ninja superstar Raizô Ichikawa, and for ninja fans is a must see.